Nintendo has brought VR to the Switch in the most Nintendo way possible. The venerable gaming company has shown off its Nintendo Switch Labo VR Kit, a set of cardboard accessories that are assembled by the user into different shapes, one of which is a VR headset that brings to mind Google Cardboard, but the other potential arrangements are even more interesting. Each cardboard peripheral, dubbed ‘Toy-Cons’ by Nintendo, enables specialized games which allow you to use the Switch in new ways. For example, the Blaster naturally offers a shooting game, and a Hungry Hungry Hippo-esque game where you fire food into their mouths. More outside-the-box ideas is the Wind Pedal, which is placed by your foot blows air up towards you (used in a jumping game) and the Bird (makes you into a bird, obviously), and the Elephant, the trunk of which serves as a VR paintbrush and creation tool. Alongside these innovative controls, Nintendo also unveiled VR Plaza that features over 60 minigames to explore in virtual reality. Even better, there’s a game creation kit called Toy-Con Garage VR. This lets you design your own BR games with some very simple programming interfaces. 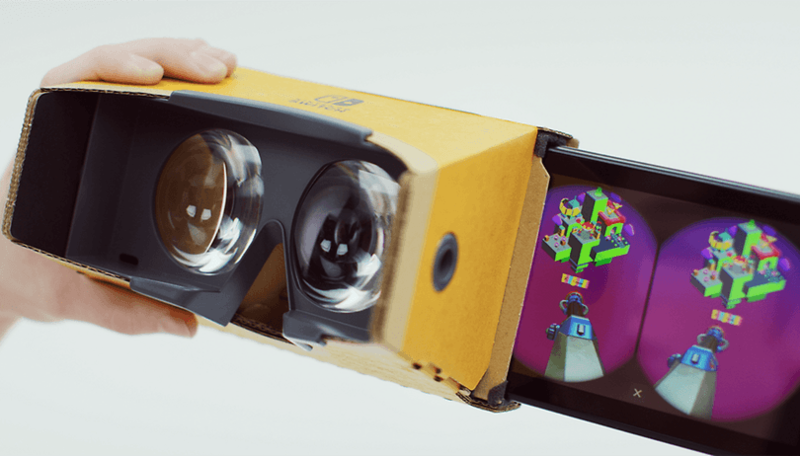 The materials may be cheap and the VR viewing experience through the Switch's VR 1280x720 display isn't going to be crisp and beautiful, but that looks to be beside the point in a toolkit aimed at creativity rather than immersion. All, in all, it looks an impressive VR experience that could get kids excited about VR and still involved in the real world. The Toy-Con Garage VR could even be very inspiring and education to budding VR engineers of the future. Nintendo Labo VR launches on April 12 and costs $79.99 for the full VR Kit, which includes all accessories, and $39.99 for the Starter Set + Blaster. What do you think of the Nintendo's take on VR? Do you know some kids who would enjoy it?